Solus Lighting LTD is thrilled to announce the launch of their newly designed website. With a fresh look and clean layout, the site is easy to navigate and highlights the true craftsmanship of this highly specialized team. 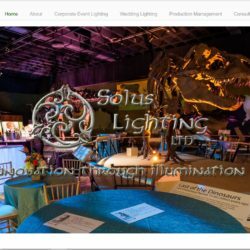 “The new site is not only packed with valuable resources for our clients, it also visually communicates the superior standards and attention to detail we bring to every event, large or small,” stated Maureen E. Patterson (Lead Designer/Owner, Solus Lighting LTD). Pat Altvater (President AFP Marketing) was passionate about the project from the first conversation, and maintained that passion throughout the design process. Altvater commented, “Not only was it a real joy to collaborate with a professional like Maureen, it was also fantastic to have so many beautiful images of their past engagements to choose from to put on the various pages. We’re very proud of the way it all came together.” After speaking with over a dozen outside firms, AFP Marketing was the most flexible and willing to customize all the details Solus Lighting was looking for. “Pat and her team made the whole process easy for us, and the result is spectacular,” Patterson said. AFP Marketing is an outsourced marketing firm based in Toledo, OH. with clients throughout the United States. They specialize in giving their clients increased credibility and visibility online. That could be through website creation or redesign, content video marketing, digital magazine creation or content writing. Find them online at http://afpmarketing.com.